Congratulations on raising more than $11,000! ArtSeed would like to give a hearty thanks to all sponsors, volunteers and Art-a-thoners for making the Tenth Annual ArtSeed Earth Day Art-a-thon another uniquely magical day! We are especially grateful to those who helped behind-the-scenes, before, during, and after the event. Spending long hours planning, monitoring, and cleaning up. To those who gathered pledges and in-kind donations from family and friends, you rock! Gifts of money, talent, and time changed the world one artist or child at a time each hour of that wonderful day – and it continues this Summer! On Saturday, April 21, 2018 we made a variety of art at different stations during the ten-hour day. Art-a-thoners had a great time working to live music by the Bay School Band, Bill Klingelhoffer and Linda Robertshaw, Jan Van Buyten and his band. 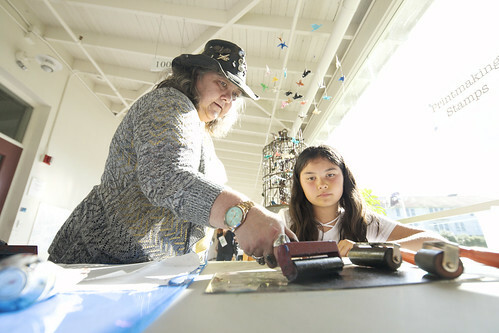 Artists of all ages practiced drawing, painting, sculpting, collage, printmaking, and crafts. We got to see calligraphy and wood-carving demonstrations. Tremendous gratitude to our volunteers, especially Myriam Abramovici, Liora Ami, Gino Bella and family, Sara Carasso, Stacey Carter, Sabine Gysens, Trey Houston and family, Karen Kelley, Marissa Kunz, Caroline Liddell, Raoul Martinez, Quinn McSherry, Jeremy Menzies, Linh Nguyen, Ann Reesman, John Scheib, Leslie Schwager, Anita Smith-Christopher, Jennifer Spencer, Jacob Spies, Catherine Sun, Velvet Van Bueren, Chris Webber, Michael Yip, Yi Zheng, Jia Zhu, Zoe Zhu. Heartfelt thanks to satellite ArtSeed artist Luned Palmer, who organized her own Art-a-thon in New York. A special shout out to the top three fundraisers this year: Sabine Gysens (1st place), Josefa Vaughan (2nd place), and Luned Palmer (3rd place). Thank you to our in-kind donors: Artist & Craftsman Supply, Books Inc, BradBag San Francisco (Thanks again to Sabine! ), Café Rx, Caroline Liddell (Handmade Quilt! ), Causwells, Charles Boone (art collection pieces! ), Cheap Pete’s, A Child’s Delight, El Café, Green Apple Books, Hand Touch Nail Care, Inn at the Presidio (Grand Prize! ), Jennifer Spencer (Peanut Brittle and Assorted Chocolates! ), Bette Spencer (home grown flowers! ), Jia Zhu (legos and snacks), La Mediterranee, Meifei (clothing design and alteration), Photograph and Frame, Sessions at the Presidio, Sorry I Broke Your Heart Hair Salon, and Walnut Cleaners.